Using the following formulas answer the questions provided below to get a greater understanding of how physics is involved in car collisions and other situations that cars get in. 1. A 3500 kg car is travelling east at 90. km/h and realizes that the road is becoming slippery so he puts his foot on the brake to come to a stop. He stops after 45 metres. Find the coefficent of friction between the road and the tires on the road. 2. A 3250 kg car is driving at 50. km/h and the driver provides a force on the brakes to bring the car to a stop at a stop sign. If the coefficent of friciton is 0.65 how far did the car go before stopping? 3. 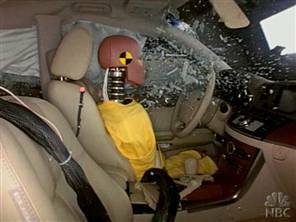 In a car testing lab the scientists want to find the force a seatbelt provides on the crash test dummy. The car is travelling 90. km/h and the dummy weighs 80. kg. When the car stops it and the dummy travel 1.5 metres in the process. There is constant acceleration in the collision. Find the force the seatbelt exerts on the crash test dummy.